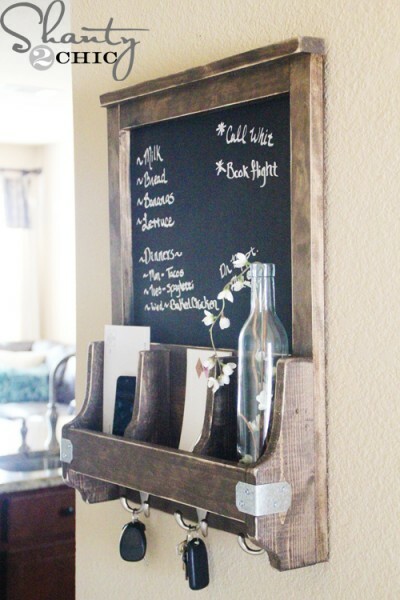 A few months ago, the gals at Shanty 2 Chic – Whitney and Ashley – posted the plans for this adorable chalkboard mail and key holder on their site. Ashley seemingly whipped it together with her eyes closed, because she and her sister are amazingly talented. I immediately knew that I wanted to build their simple, beginner-level plan, but I needed to figure out where I wanted it to go in my home. After giving it some thought, I decided that I could adapt it for use in my kids’ bathroom as a cute place to hang towels and store bathroom accessories – a glorified towel rack, if you will. But since it was going in the bathroom, I wanted to make a little change to the original Shanty 2 Chic plan. Instead of painting the back of the piece with chalkboard paint so that it could actually be used as a chalkboard, I designed an image in Photoshop Elements that looked like chalkboard art. That way, the chalkboard would always look fresh – and hide my lack of true chalkboard art abilities. I dry fit the piece together, measured the opening for the chalkboard itself and sized my image to fit into that opening. Tom has access to a large format printer, so he printed the image for me for a few dollars. I used spray adhesive (Super 77 is my favorite) to attach the image to the backing and then built the piece on top of it per the Shanty 2 Chic plan. It turned out so cute, and I was excited to stain it. I taped off the “chalkboard” portion and covered it in plastic, and then I stained the piece with some stain I had left over from the herringbone wood wall. This was FAIL #1. I forgot was too lazy to pre-condition the wood, so the stain came out super blotchy. Ack! I thought to myself, “Well, Lindsay. You can rebuild it or figure out something else.” I voted for the “something else” plan. I grabbed some old white paint and slapped a couple of coats on the piece. I figured I could distress it after the paint was dry and it would still look pretty cool – plus the stained wood would show through and look more authentic than bare wood. Once the paint was dry, I removed the plastic and tape from the “chalkboard.” Um, FAIL #2! The tape, which I tested before I put down, ended up tearing the paper. AAAHHH! This is the point where I almost decided to throw the whole thing in the garbage can. I came up with a plan, but that just involved eating cookies. While I was eating the cookies, I developed a second plan. I tore off as much of the paper as I could and used my hole saw to cut a hole in the backing piece. Then, I cut another piece of hardboard that would fit into the “chalkboard” space and sent Tom back to print me another copy of my image. I used the spray adhesive again to attach the image to the new piece of wood, and then I sprayed it with an acrylic matte sealer so that it will (hopefully) withstand some of the moisture from being in the bathroom. I finished the project with the hardware that Ashley suggested and hung in on the wall in my kids’ bathroom near the shower using D-ring hangers and Monkey Hooks (my favorite way to hang anything on drywall). It’s really steady and secure. The cool thing about my final project is that it turned out better than the original that I was planning. 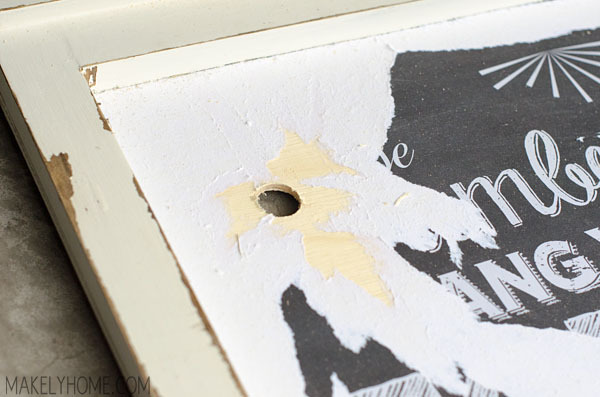 Because I cut a hole in the back of the piece, I can use my finger to pop my “chalkboard” in and out of the frame. I can design other messages to go in the frame as little surprises to my kids – like Happy Birthday, Good luck at the soccer game, etc. – and I can easily attach them to a piece of hardboard and stick them in there. Sometimes, it’s good to have a few fails. Don’t be afraid to keep tackling a failed project until you come up with a solution. Getting creative when you feel stuck often times yields even better results! Hey Lindsay! 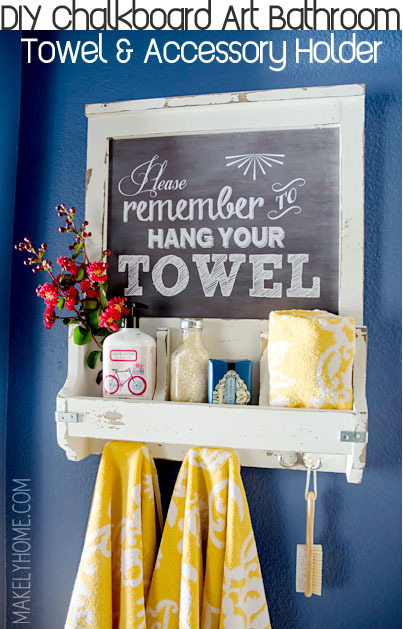 Love your towel hanger! What a great spin:)) Thank you for the shout-out! Wow, that is so cute! I really like it. I love this..and particularly that you post , not only your fails, but your solutions…there is nothing worse than a complicated tute that makes a person feel inadequate when they have a fail (happens often to me) and yet the person who wrote it insists on it’s ease and simplicity….but then, true creative types always try to find a way around a problem…it’s just refreshing to see someone admit it.. This is awesome! Love it so much! 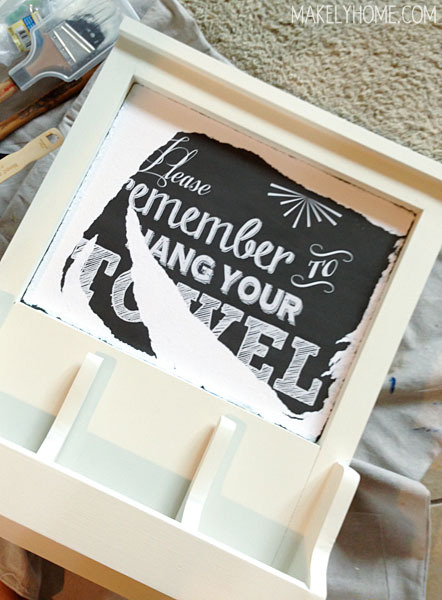 Any chance you’d offer the chalkboard image as a free printable? This is wonderful! I have been following your project on IG and I love it! 🙂 (I also love the lotion with the bicycle on it! My eyes tend to wander all over the picture. 😉 ) Have a great day! ~k. I love how it turned out! It looks great! And I totally get the being so frustrated with a project you almost toss it and move on. Glad you didn’t this time! 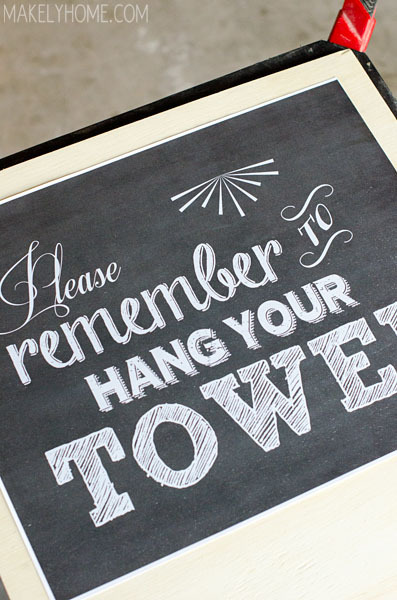 Your chalkboard/towel rack is absolutely adorable! It looks like it is straight out of a magazine. Thank you for sharing your wonderful ideas! Love it! I saw the fail on Instagram and was wondering what you were making. Love how it turned out in the end. So fun! I love it in the white color. It turned out so cute, Lindsay! Love this project. I love that you shared the fails and solutions. Sometimes these projects i see online look so easy until i actually dive in and find out that I’m not as crafty as I thought I was 🙂 Any interest in sharing your printable? I love this towel rack! And I am way over the top in love with your towels! 😉 Could you share where you got them? can you share the image file??? I love this. I am new to building and want to try this! 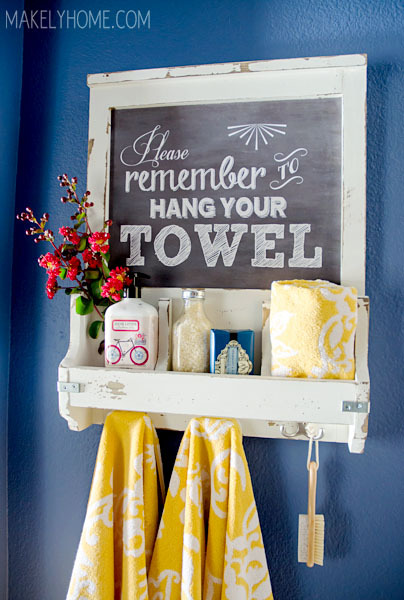 Your towel rack & accessory holder looks great!! 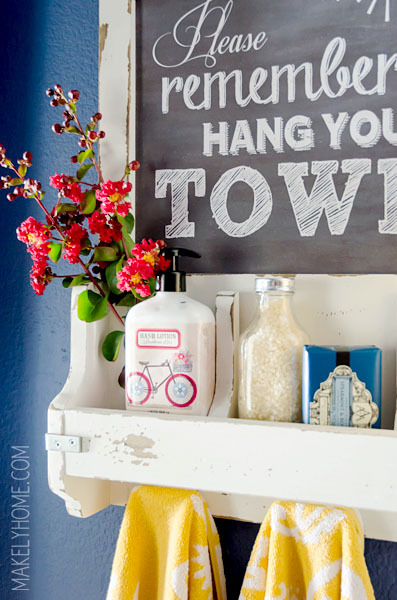 I’ve got this linked to my post on DIY towel racks too, for inspiration! Would love to know the fonts you used for the bathroom towel rack. Super Cute!!! Just wanted to say I love reading through your blog and lpok forward to all your posts! hay fever headaches are a dull, excruciating pain that is felt right in the center of the head. These models represent lifelong investments that pay rich dividends in the long term. I was just thinking, candles? That’ll get you a library ban! Your towel rack & accessory holder looks tremendous. I love this towel rack. Could you share where you got them? I really fix it on my bathroom. This is the really beautiful post. Your bathroom accessories information is very helpful for the people. The towel rack is very essential accessories for a bathroom but another accessories very important for the bathroom as like shower panel, faucet, sink etc. Thank you for share such an informative post. This seems to be the best one that I am looking for setting my own bathroom. Thanks for your suggestion.